M&As have to some extent bounced back from the 2009 lows, however they are pretty much hovering around pre-crisis levels. Activity during the last three years seems to be quite out of sync compared to the precrisis highs or the stockmarket comeback. Then again one could argue that this is just the normal way of things and that the stockmarket hike is due to the QE or the 2006-2007 mergermania to the abundance of leverage. On the other hand M&A cycles move in 5-7 years intervals so we may just be waiting for the next big story that will spark a boom. Global M&As reached $ 2.2 tr in 2012, barely posting any growth from 2013 with North American deals at $943bn up 5% from the year before. These figures amount to 2/3 of the 2006-7 deal value. We have to go back to 2004 to note an increase of a mere 2.3% CAGR which actually lags even GDP growth, at least when it comes to the US. There’s always talk of growth but for the time being it pretty much sounds like Beckett’s “Waiting for Godot” play: it’s unclear what the next big thing will be and when will come, let alone if it’ll come, but then again that’s always the case. In the first three quarters of 2013 global M&As reached $1,607 bn according to Mergermarket; a 5.5% increase over the same period in 2012. US at roughly $535bn accounted for 40% posting a 22% increase while Europe for 30% at roughly $480bn and a meager 2.4% growth. Taking into consideration that 2012 had a quite strong M&A finish, it’ll be interesting to see how things will evolve at year end as there are fears that the US government shutdown may have cooled the market. Total global PE buyout reached $259bn in 2012 with US representing almost half of that. PE activity has grown at 25% post 2009 lows in Europe and Asia but in the US, where PEs are more prominent, growth was double that at 50%, according to Bain. In the first three quarters of 2013 PE buyout activity reached $ 194bn a 11.6% increase over 2013. For more information about recent PE activity you may refer to our post here. The M&A increase in the US is attributed to the existence of cash, return of mega deals but also public to private deals. Bigger US deals were those of Verizon Wireless ($124bn), Heinz ($27bn) and Dell ($20bn) the latter two being PE driven. In Europe that has been going through fiscal crisis and recessionary pressures, among the most prominent deals were this for Virgin Media ($25bn). So, where is the M&A market heading? Let’s try be a bit inquisitive in this blog by looking at the connection between GDP and stockmarket; apologies to academics and analysts who thought of this before. Looking at GDP, DJIA and M&A trends in the last 10-15 years we see that the stockmarket has overreacted to the crisis and didn’t keep pace with GDP growth, only recently catching up. So probably things are just starting to look up. Despite talk of exuberance, the average P/E ratio at the NY Stock Exchange (Dow Industrial) is 17.95 compared to 14.45 a year ago. S&P500 P/E is at 18.85 compared to 16.5 according to WSJ data. Although valuations seem quite hefty they as well depend on what point in the cycle we stand and what’s the ability to generate extra profits. Still valuations are much lower than during the crisis when average stockmarket P/Es reached three digit figures, so exuberance may still be kept in bay. On the other hand when DJIA growth patterns exceed those of GDP such as in 2001 and 2007, it doesn’t turn out that well, with the exception maybe of the post great recession era. On the other hand M&As are usually slow to follow the other two upward trend; often lagging by a couple of years. True to our focus in this blog let’s see what happened to cross-border deals especially in the transatlantic space. Cross-border M&As are almost half of global activity compared to much lower importance a decade ago, an indication of today’s interwoven globalised world. During the last years there has been some decrease, especially when it comes to outbound activity from Europe, while US interest in Asian and emerging markets remains strong. Main cross border inbound/outbound deals in the Americas last year were Grupo Modelo’s acquisition by Anheuser-Busch ($20bn) and Sprint by Japan’s Softbank ($35b). Among the more significant outbound deals were Liberty Global’s acquisition of Virgin Media ($21.8b) and Alliance Boots by Walgreens ($6.7bn). Cross-border deals are more evident in the energy sector. In the transatlantic space activity has been pretty much subdued, staying below the precrisis highs. Total transatlantic deals amounted to $180bn in 2012 ending lower than in 2011, with an average size of around half billion US$. By comparison during 2008 transatlantic deals reached $ 270 bn (see our past blogpost about Transatlantic M&As in 2008). NorthAmerican buyers took the reigns over European, reversing an earlier trend that saw European companies being the ones most often making the leap across the Atlantic, trend especially profound in the aftermath of the latest US crisis. UK and Ireland were the most active markets for inbound activity in Europe. Although international expansion makes sense for large companies we have argued here that it’s also the obvious move for middle market companies that can this way grow to global niche players once a product and operating model is tested in their domestic market. However the challenges are in analyzing and executing the deal and finding qualified advisers with global exposure and experience with middle market peculiarities that are able to be profitable at this level of fees and challenging global regulatory framework. The Big4 along with a handful of boutique investment banks and consultancies may be able to carry out this role, but one has to research their value proposition before committing. Sectors with particular M&A interest in US are TMT, Energy, Industrials and Pharmaceuticals. Industrials along with Business Services tend to have more activity due smaller deal size and higher frequency. In a change of times Financial Services have been lagging in importance, a far cry from mid 2000’s, but then again the sector has had its fair share of troubles post crisis (Source: The Future of M&As in America, Merrill Datasite and Mergermarket, 2013). There are different drivers for transactions across industries. Low growth and interest margins as well as technology and compliance burdens drive M&As in financial services, same with insurance. Consolidation is the theme in TMT, especially when it comes to digital and mobile transition. In pharmaceuticals is about getting access to smaller companies with promising drugs. In consumers is about cash rich companies using reserves and expansion, same with energy where buyers are looking for smaller targets with resources. Industrials are looking for expansion to new markets as well as consolidation benefits. The affordable healthcare act changes the competitive landscape in the healthcare sector and is expected to increase consolidation between insurers, hospitals and independent practices (Source: NA Deal drivers 2012-13). Global multiples have decreased post crisis from the low teens to well into single digits. In 2012 the average EBITDA multiple was at 8.8X down from 9.1X in 2011. Multiples further fell in Q1 2013. US multiples were at 9.3X in 2013. Tax cuts expiring in 2012 pushed down multiples as US shareholders rushed to realize investments before capital gains rates shot up. In Europe multiples were much lower at 8.6X, down from 10X in 2011 but let’s bear in mind that Europe is going through a recessionary phase and fiscal crisis that puts pressure on earnings. Most of activity is intraEuropean continuing a long consolidation trend. Multiples in Asia fell because of economic slowdown. When it comes to industry specific valuations higher prices are currently offered for energy companies. Can’t resist however to bring up here Al Gore’s reservations over these valuations arguing that they are based on reserves that will never be probably extracted. Better IRRs are offered in TMT rather than energy or industrials as well as better EBITDA. Valuations are low in financial services, less than 1.25 book value. Latin America with favorable demographics and growth prospects for many even better than those in Asia, offer good M&A prospects, hence a solid base for higher valuations. In this context Modelo brewery was bought in 2012 at a 14.1 multiple. Private equity multiples are low as IPOS are down and many exits are realized thought secondary offerings. PE financing multiples are currently at the 7-8 range with average exit multiples at 11 according to Mergermarket. Refer to our post on PE activity in 2012-13 for more info. 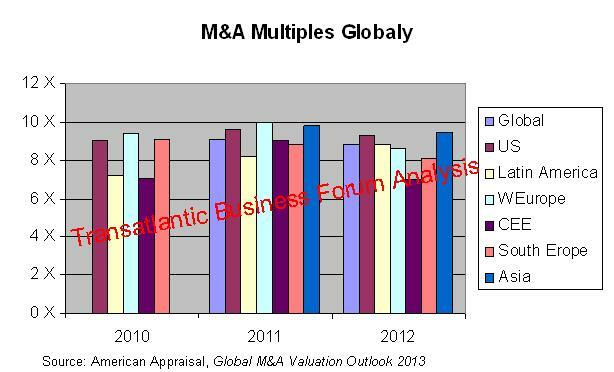 American Appraisal expects M&A multiples to increase in 2013 as US economy will continue to fair well, Eurozone sort out its problems while Asia continue to grow (Global M&A Valuation Outlook 2013). In order to realize value from M&As it is important to get valuation right as well as due diligence and post merger integration. We are not getting tired to remind Graham’s saying that Warren Buffet goes by: ‘Price is what you pay; Value is what you get’. Getting price and value to meet is not always easy, in fact most of times it doesn’t happen. An example of that comes from a KPMG analysis of stocks of certain companies’ engaged in M&As during 2007-2008. Average size for those deals was at $2.3b with the median at $620m. What KPMG found is that companies announcing deals in 2007 saw prices fall by 8.4% 24 months later, while those during 2008 increased by only 2.5%. As expected those targets with the highest PEs at acquisition offered the worst returns. According to KPMG deals “during exuberant 2007 may not have received the same level of due diligence as those in 2008 when it was much more difficult to complete transactions” (Source: The Common Determinants of M&A Success, KPMG 2011). This disappointing performance may well have to do to some extend, with the overall stockmarket trend. On the other hand one can’t deny the importance of getting the valuation right. Aside from valuation, critical factors for successful M&As are carrying out an efficient due diligence that will unearth issues and proceed according to a well designed post-merger integration plan that focuses on effective communications, quickly establishing goals (usually under a 100 day timeframe), having a post acquisition plan in place, well before closing and selecting key people. That’s at least according to a survey of M&A practitioners, carried out by Deloitte and Mergermarket in 2012. Although expectations about middle market activity arising from the sector’s massive size and pockets of underperformance, it hasn’t picked up the slack left by the eclipse of mega deals. The market simply seems to lack direction. Activity across segments is moving in tandem. Middle market activity in 2013 (ie deals between $500m-$2b) was at over $800 bn according to Mergermarket or around one third of total global M&A value, posting a small increase over 2011. During 2013 Q1-Q3 middle market deals in the US were valued at $400bn, down 7.7% compared to the same period in 2012. That was mainly due to decrease in Europe and US; Asia shows much more resilience in this segment. Looking at the European-US combined space in the lower middle market ($250-500m) we see that deal value is not that much different from the pre-crisis levels of $150b in 2004 and only at 2/3 of the 2006-2007 highs. What’s important at least is that middle market has recovered compared to after the crisis when it fell to almost 20% of global M&As. According to Citizens Bank’s 2013 Middle Market Survey, around 80% of middle market companies (defined as those with $5mn-2bn revenue) are currently open in making an acquisition with 20% actively engaged. Acquisitions in this space are of smaller size and more frequent. Buyers tend to buy smaller firms that can absorb more easily. Most of the deals are below $10m in value. Their main M&A motive is to increase revenues. Geographic expansion, adding products or putting cash to work come up frequently too. Other reasons are buying-out underperforming customers or taking out competitors; objectives may differ in middle market compared to big business. Small firms and tech companies especially are looking at acquisitions as means to add talent and know-how while manufacturing companies as an opportunity to add distribution. Although post crisis there’s better availability of debt financing only about 20% of companies are currently looking at raising capital. A quarter of the market is also looking at selling to upload outperforming segments, raise capital or create liquidity for their owners. As a common theme, many baby boomers will be looking at monetizing their holdings and retire in the near future. There is a good case for M&As in this space, as it has depth and room for improvement but also some factors inhibiting it. We have covered middle market and PE activity as well as success factors on earlier posts: Private Equity 2012-13 Update and Success Factors for Value Realization, Middle market cross-border M&As set to grow, Large Private Equity Deals-that 800 pound gorilla. According to Citizens’ Bank, the main concern when undertaking a middle market M&A is undetected liabilities. Information is more difficult to gather and audit in this segment. Conducting adequate due diligence, losing key employees or clients and off course valuation of the company are other frequent concerns. It seems that most of the middle market executives are aware of the process and don’t shy away from getting involved in them. Almost 70% deals are managed internally with advisors coming in for valuation or due diligence; however the devil is in the details. Another “detail” is that traditional finance theories such as the CAPM may not completely hold in this segment. Cost and access to capital and investor profiles may differ than for large public companies (see Robert T Slee, Private Capital Markets: Valuation, Capitalization and Transfer of Private Business Interests, 2004). There are certain adjustments to be made. Market participants can go by gut feeling or rule of thumbs but often that may not suffice or hold in the eyes of auditors and regulators that come to review them. And the list of details can go on. Even if however the buyer’s management has dealmaking experience we would argue that the challenge comes in the form of bandwidth availability. Buyers should mind to preserve the value of the business while analyzing the deal or later merging the two organizations. So it’s all about whether management can handle the workload at the same time that doesn’t take their eye from the ball ie, day-to-day operations and customer service. It’s also usually not always possible to leverage the acquired companies’ management as prior leaders may create political or loyalty conflicts that cause more harm than good, let alone not able to perform under the new playbook. Actually as discussed in previous posts, in most cases prior management is replaced. Best practices approach calls for delegation of the M&A process to external experts or devoted teams, albeit with clear senior management endorsement and commitment. Other specific challenges with middle market M&As arise in the context of cross-border transactions. Knowledge of foreign economic circumstances, business practices, cultures, regulatory and tax regimes is not easily attainable without local expertise. In these cases it is better not to try reinvent the wheel but simply look for competent local or global advisers; problem is that there are not that many middle market advisers with true global reach. Future Trends: Dare a comeback prediction for 2015? M&A activity is expected to increase as the economies and stock market recover. In a survey of more than 150 investors and corporate executives performed by Mergermarket in 2013 (The Future of M&As in America, Merrill Datasite and Mergermarket, 2013). Almost 2/3 of respondents expected activity to increase, at least when it comes to the Americas. US companies turn to M&As as means for expansion (access to new markets) vertical integration and synergies. Asian Pacific economies keep on exhibiting strength and local companies see opportunity to acquire targets in US or Europe to gain access to markets and technology. It is expected, in this poll at least, that most of transaction activity will happen in the lower middle market i.e., $250-500m and below. Then again that may primarily indicate frequency and not overall value. So where will it be the next big thing for M&As if there will be one, and when? Will it be middle market, emerging markets, technology, energy, cross-border, public to private, PE or stock-market driven? We’ll have to wait and see. It seems that after all what the market is missing is leadership, as the popular saying goes, that mainly comes from mega deals and the availability of leverage. That’s what moves the needle. Looking at the latest two economic cycles, the fact that we’re four years in the current one, the economy keeps on growing and the stockmarket breaking highs could one bet, just even by looking at the graphs, that M&As will come back with a bang in 2014 or most probably 2015? After all, as optimism keeps settling in among at least the investment community, this is an environment that buyers will feel comfortable or even compelled to make a move or otherwise feel pressure for stock buybacks and dividend payoffs by activist investors as lately often happens. So shall we wait for Godot for a couple more years?